This article is a continuation of previous comments on financial crises, with two lines of discussion. The first is a bit of a primer, explaining why I and other commentators associate financial crises with a buildup of private debt. The second part discusses the main problem with associating crises with private debt buildups: growth in debt stocks is by itself not enough to trigger a crisis. The catch is a variant of the efficient markets hypothesis: if we could easily forecast crises, it would be easy to outperform markets. However, other market participants are trying to do the same thing. I will start off with the explanation why we focus on private debt in the context of financial crises, by the process of elimination. Roughly speaking, we can lump financial instruments into acting like equity or debt. In the modern environment, equity markets are not enough to generate financial crises. If we turn to debt instruments, we are either looking at private sector debt, or government debt. It is certainly possible for government debt to be associated with crises. However, these are policy-driven crises, and do not fit the pattern of private sector behaviour described by Hyman Minsky. Such crises should be analysed differently than a crisis driven by private sector debt. What happens to equity prices is not the causal factor behind modern financial crises; instead, equity prices tend to fall in response to fears of a financial crisis. The fact that equity prices are falling based on expectations means that downturns should in fact precede the “official dating” of financial crises (by economic historians, who presumably might use the event of a major default as the start date of the crisis), one could plausibly give a quantitative argument that an equity price collapse caused the crisis. Given the emphasis in modern academia on various statistical tests, such an argument could be the received wisdom. Given that my arguments are largely qualitative, I will just sketch my arguments as to why I downplay equity markets in analysis. One initial disclaimer that must be emphasised: I am referring to the post-World War II experience in developed countries; equity markets behaved quite differently in earlier eras. The reason to downplay the importance of public equities is that they are no longer an important source of finance for large firms. (Private equity matters more for small firms, but the illiquidity and opacity of private equity means that outsiders have no way to tell what is happening to their prices.) The figure above shows the net issuance of equity by non-financial corporations. Before the 1980s, equity issuance was generally positive – the equity market was a source of funds. Since then, corporations have followed academic theories, and levered up their balance sheets to “maximise shareholder value.” The result is that the equity market is a net drain on corporate finance – firms buy back more shares than the small amount that is issued. It should be noted that equity financing can be important for some sectors of the economy. The Silicon Valley economy is one well-known example, but there are other examples, such as the mining exploration funded by penny stock investors on the Vancouver Stock Exchange. (This was a popular pastime up until the 1990s; not sure if it exists to any extent anymore.) However, the financing is not broad enough to move the macro-economy. The Tech Boom of the 1990s would probably be the counter-example to my thesis. The equity bull market fever certainly helped propel animal spirits, and so was arguably a causal factor for the boom. That said, the role of equity financing was limited: the “dot-com” firms did issue equity, but they were tiny companies employing a handful of people (albeit with massive stock market capitalisations). The real boom in technology infrastructure was financed by debt. 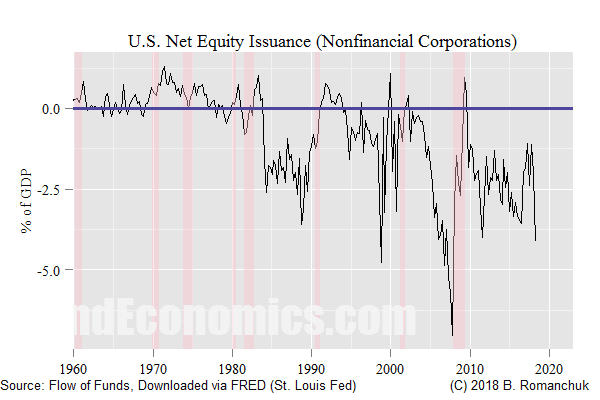 Despite the heady valuations, net equity issuance was still negative during the expansion, as seen in the earlier figure. Equity markets are a critical part of capitalism, and they will fall ahead of financial crises. However, in an environment where equity markets are not an important source of capital, disruptions to the equity market alone are unlikely to disrupt the real economy. The qualifier “central government” is important. For example, if a large province in Canada defaulted, I would expect that it would be associated with some form of a crisis. Since the provinces are not owners of the central bank, such a default remains a possibility. We would need to lump such cases in with the “private sector,” which is discussed below. If we look at a longer range of history, or extend to countries that have some form of constraint on their currency (including being a member of the euro), we can find crises linked to central government policy. Therefore, any broad analysis of crises would have to include looking at central government debt. However, as argued earlier, such crises are different than ones generated by private sector debt dynamics. At present, I am in the process of deciding what the topic of my next book will be. One possibility is the analysis of recessions, and it would look at private sector debt dynamics. The other possibility will be a discussion of floating currency sovereign default risk (a contender for “The World’s Shortest Book” prize). The possibility of a crisis associated with government debt is a topic that would be covered in the latter book. Before we turn to focus on debt crises, we will have some initial remarks on foreign currency debt. Crises associated with borrowing in foreign currencies are relatively common. Such foreign currency borrowings are often referred to as the “original sin” of finance: the cash flows to repay debts are not denominated in the same currency as the debt service cash flows. This can obviously go very wrong. What we do see a lot of are foreign lenders holding foreign currency debt. Japanese investors are relatively famous for buying foreign currency debt paper, given the rock bottom nominal yields in Japan. However, it is the owners of the debt who are exposed to the currency risk: the borrowers cash flows are in their domestic currency, and so they are not facing any particular risk. One needs to be careful looking at debt statistics. Most large issuers will also issue foreign currency bonds, such as Canadian provinces. However, the issuer will almost invariably use a currency swap to eliminate the foreign exchange risk. Additionally, international issuers often have international operations. For example, many large Canadian firms will have U.S. dollar-denominated revenue streams. Foreign currency borrowing will actually reduce the foreign exchange risk of the consolidated firm. In summary, if we look at a wide history of crises, foreign currency debt will often show up as a factor. However, this is not really the case once we confine ourselves to developed floating currency sovereigns, which we should expect to act differently. Furthermore, the difficulty in determining whether the private sector has a meaningful foreign currency exposure in a modern financial system is difficult. By process of elimination, we end up with domestic currency denominated “private” debt. (Once again, I am lumping sub-sovereign governments in with the true private sector; we could refer to this as the “non-central government sector,” but that is an unusual phrasing I wish to avoid.) Taking note of the previous disclaimers, we should associate these instruments with financial crises (as opposed to crises caused by government policy). If we look at the debt issuance volume for the post-1990 era for a wide range of countries, household mortgage debt is the major source of debt growth. If the absolute size of debt was the only thing that mattered, we would expect financial crises to be associated with housing market crises. If we look at the historical track record (which I hope to expand at a later date), we do quite often see housing markets (or at least condo markets) to figure in with financial stress, either in the mortgage bond market, or the banking sector. Credit losses were heavily concentrated in asset-backed securities that were used to finance household borrowing, however, one may note that there was extreme levels of leverage associated with derivative bets on corporate bond credit quality. This does not have to be the case. In the United States and countries in a similar position, the 2001 recession was associated with a wave of poor corporate investment decisions; housing markets were largely untouched (other than regional weakness associated with the sectoral nature of the downturn). Furthermore, if we look at the Japanese bubble, I believe that Japanese household balance sheets were relatively clean; the leverage was associated with commercial real estate and the corporate sector. (As a disclaimer, I am working from memory on that observation; I will need to examine that assertion as I dig further into the research.) Corporations tended to borrow against the real estate holdings, so corporate leverage coincides with the famous bubble in land prices. The problem with associating private debt buildups with financial crises is that debt can build up without there being a crisis. It is not too hard to come up with reasons for the absence of a mortgage meltdown, despite the rise in the stock of debt. The first point is that mortgage interest rates have collapsed, allowing households to service a greater mortgage for the same cost. The second point is that the relative decline of some prices (notably imported goods) has allowed mortgage servicing to grow to be a larger of household income. Finally, Canadian mortgage lending standards were relatively tight up until a series of reforms to regulations that started around 1998. (This coincided with the "hockey stick" formation for house prices, funnily enough.) 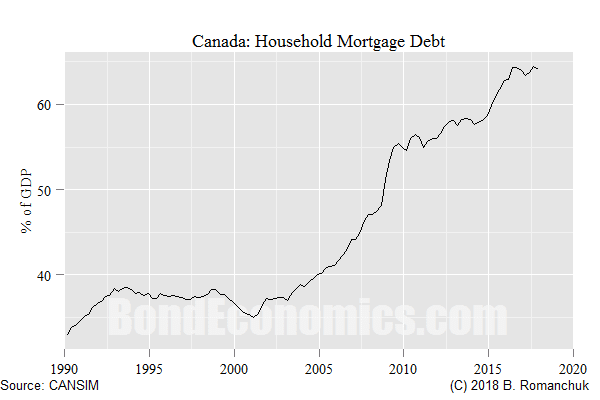 To the extent there were problems in Canadian housing finance before 1998, it was in the new-fangled condo market (which worked around the regulatory scheme). The previous levels of mortgage debt at a national level were low when compared to international peers, or even the high cost Canadian markets of Vancouver and Toronto. The other thing to keep in mind is that mortgages are normally conservative financial structures. To use the Minsky terminology, they are hedge structures, since they are amortising. (In Canada, the only real risk is associated with the interest rate reset; mortgage regulations in Canada are designed to protect banks more than households, and it is (or was) difficult to get a fixed interest rate beyond a five year term. This is unlike the United States, with its 30-year conventional mortgages.) There is no need to refinance principal, which is the standard procedure for corporate borrowing. The need to refinance principal creates the risk that the markets might not be receptive for rolling over debt, and so Minsky referred to such a strategy as speculative finance (since the borrower is speculating that markets will be open at refinancing time). Of course, it must be noted that given enough Ph.D.'s at investment banks, it is possible to turn even the safest investment structures into toxic assets. The American banking fraternity managed that feat in the run up to 2007, which has to be viewed as some kind of an achievement. The need to understand what is happening to lending standards -- which is a fuzzy, qualitative concept -- is what makes it hard to come up with simple mechanical rules relating debt stock changes to the odds of a financial crisis. As noted earlier, it could just be lower interest rates raising the debt servicing capacity of borrowers. Everyone on the lending side has an interest in knowing whether borrowers are over-extended. The problem is that if they get too conservative, their peers will instead do the lending. Their market share will shrink, projected profits will go down, and their equities will underperform. (The latter point is the most crucial in the C-suite.) As long as someone is willing to keep extending financing, even the shakiest borrowers can roll over financing and keep the show on the road. ("A rolling loan gathers no loss.") So as long as someone else is going to be rolling over debt, you also want a piece of the action. As a result, the lending process resembles the herding behaviour seen in financial markets, even though bank lending is not executed in a transparent fashion like a stock exchange. Financial analysts are expected to come up with fair value estimates, but very few (sensible) people expect them to be able to forecast every wiggle in stock prices using those fair value estimates. Calling a financial crisis is a market call, and timing is not easy to do. Private sector financial crises are associated with private debt buildup. Unfortunately, we cannot expect simple rules based on debt growth to be able to accurately predict such crises.